All the blue blotches are images of a far-away galaxy, which are focused by the cluster of galaxies in front. By the way, both Newtonian Theory and Einstein Theory predict the deviation of light by matter (more so with Einstein, as time slows down, allowing for more time to deviate). That energy is NOT conserved is essential to enable the creation of universes at the drop of a hat. Nothing is really true anymore, even energy is not conserved. It costs nothing to create a universe. Next we will all be led to believe plutocrats create not just jobs, but universes. It’s probably related. Thanks, Sean. 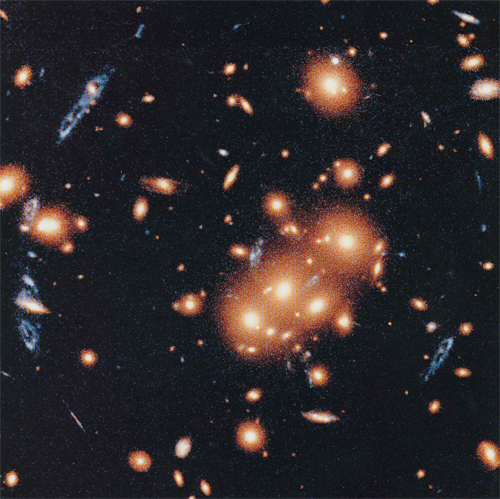 So take two galaxies clusters, G1 and G2. Suppose they separate from the expansion of the universe. Sean Carroll, following the Multiverse fashion, asserts that it cost no energy to separate said galaxies. Then he has a photon P travelling from G1 to G2, and he sees it has lost energy, so energy is not conserved. Multiversists repeat this argument ad nauseam. In truth, what they stumbled upon is that the definition of mass-energy in the Theory of Gravitation is not clear. That’s all. The difficulty has been known for generations of mathematicians (behind closed doors). However, it does not mean that physics reduces to dust. Physicists can’t reduce the universe just to physics, physics has to reduce to mathematics, too, at least in part. One may wonder what the Multiversists reduce physics to. Apparently, having done away with energy conservation, a fundamental axiom, they replace it by universe creation. They reduce all of physics to the creation of universes. Dark Energy, the accelerated expansion of the universe, questions the entire scheme of present day cosmology, let alone physics. Starting the conversation (logos) by throwing out the most sacred principle of physics (energy conservation), and replacing it with instant karma is as glib as glib gets. Instant karma? Thanks to the alleged non-conservation of energy, the creation of trillions of universes per second per cubic meter is eminently reasonable. Does that makes Middle –Age theology sitting angels on pinheads a plausible outcome? This is reductio ad absurdum, if I ever saw it. The time-energy uncertainty relation seems indeed to allow for large energy excursions, if they happened in a short time. But that’s related to “virtual particles”, which admittedly are neither virtual, nor particles… Just resting on that would allow a universe in a length of time so short it has no meaning (because it has no clock). Agreed, physics is hard. Agreed, today’s “Standard Model” of High Energy Physics explains only 4% of the universe. But that’s no excuse to go crazy, and see gazillion universes on every pinhead. That only help the crazies. Crazy like foxes, crazy like plutocrats.